My wife pointed out that I haven’t featured this drink here before, which is surprising. It’s not the best-known of pre-Prohibition drinks, but it may have the most far-flung roots, and it’s been tied to modern cocktail culture by famed bartender Audrey Saunders, who named her flagship cocktail bar after the original club. The first Pegu Club was situated 40 miles inland along the Rangoon river in Burma (now the Yangon river in Myanmar). This beautiful country, bordered by Thailand, Laos, Bangladesh, and India, was conquered by the British during the era of colonialism in the mid-19th Century. The club was built in the 1880s for British military personnel and wasn’t open to the local population. It earned a great deal of fame, including a mention in Rudyard Kipling’s From Sea to Sea. The Pegu Club’s house cocktail, a combination of gin, lime, and curacao, came to prominence in the 1920s and has lasted longer than the club itself, which by the 1970s, according to an anecdote from The Great Railway Bazaar by Paul Theroux, had become an Officers’ Mess for the Burmese army. The building still exists, severely run down, but the club itself is long gone. The drink remains, though it owes much of its return to prominence to the aforementioned Aubrey Sunders, who opened her New York-based Pegu Club in 2005. It’s a terrific bar, beautifully designed and decorated, with some of the best cocktails in the city, and I highly recommend it if you’re in the area. The cocktail is simple to make and easy to adjust based on one’s tastes. Some recipes call for as little as a teaspoon of lime juice, while others suggest that the same amount of cuaracao and lime juice be used. I like to take the sourness down just a bit and let the other flavors come through, so I drop a quarter ounce of lime juice. I’m also generous with the bitters, using both aromatic and orange, with heavy dashes of each. Like most sours, this drink is best prepared with fresh-squeezed citrus juice, shaken thoroughly, and consumed, as Harry Craddock once put it, “quickly, while it’s laughing at you.“ – meaning while it’s still mildly effervescent from all the shaking. You can garnish it with a lime wedge if you like, though I find that the presence of a lime wedge tends to tempt people into squeezing it into the drink, which is a balance-killing mistake. I serve it without a garnish. Combine all ingredients in a cocktail shaker over ice and shake thoroughly. Strain into a chilled cocktail coupe. No garnish. This article is a modified and enhanced version of a post that ran on my nightly cocktail blog, DrinkShouts. Liquors in parentheses are what I used when I made this recipe, and are included as suggestions. Christopher Buecheler is a novelist, a web developer, an award-winning amateur mixologist, a brewer, a guitarist, a drummer, and an NBA enthusiast. He lives a semi-nomadic life with his wife and two cats, currently residing in Providence, RI. You can learn more at his website, cwbuecheler.com. This is my favorite drink yet. I love the history, the semi-obscurity (it wasn’t in my personal cocktail book), and not to mention the taste! Might become my go-to cocktail! Awesome! Glad I was able to introduce you to it. You can wear them every day. And you’ll probably never wear them out. 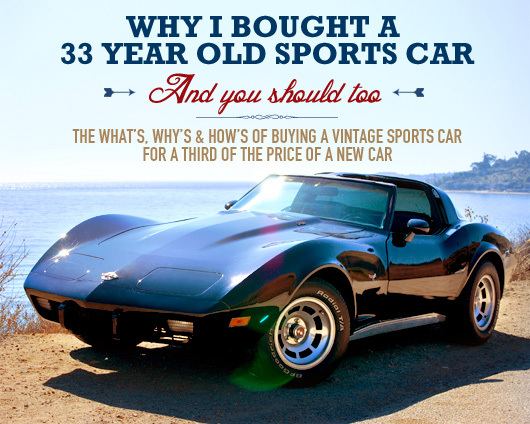 The What’s, Why’s and How’s of buying a vintage sports car for a third of the price of a new car based on my own experience of buying a '78 Corvette. You won’t believe how easy it is to make stunning, delicious bread. I didn’t. And there’s no need to knead!